Celia Shortt Goodyear/Boulder City Review Dan Thompson works on a piece of glass art at Boulder City Florist, 1229 Arizona St. He owns the business with his wife, Kris, a master floral designer. 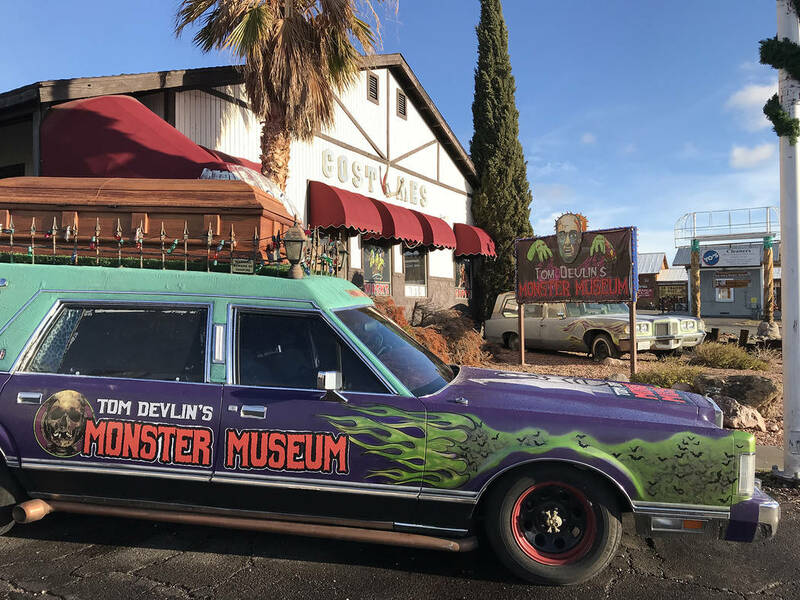 (Hali Bernstein Saylor/Boulder City Review) Tom Devlin's Monster Museum at 1310 Boulder City Parkway, has seen a spike in sales since the opening of Interstate 11 in August. The owners attribute part of that increase to appearing on a roadside attractions sign. 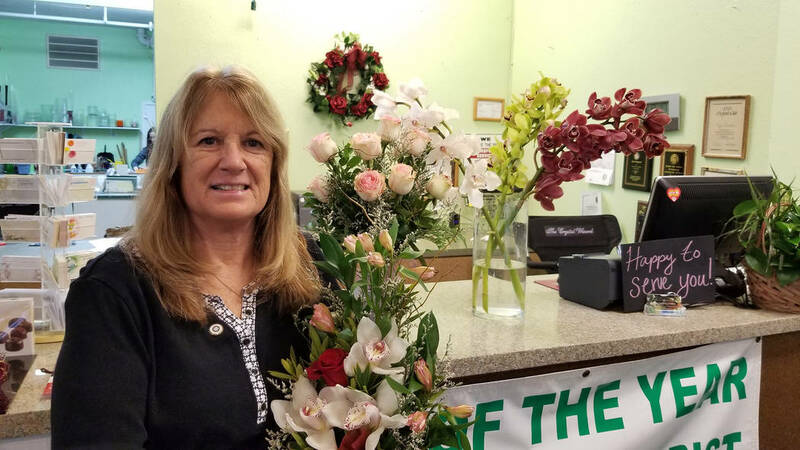 Celia Shortt Goodyear/Boulder City Review Kris Thompson, owner of Boulder City Florist, 1229 Arizona St., said her business has not been negatively impacted by the opening of Interstate 11. Tom Devlin’s Monster Museum, 1310 Boulder City Parkway, reported that its sales have increased. Southwest Diner, 761 Nevada Highway, is also advertised on the blue amenities sign on the interstate, and owner Cindy Ford said the business is still open though her sales have decreased. “It’s quite a lot less than the year before, but we’re not going to go out of business,” she said. Ford said she was worried the diner would close after I-11 opened Aug. 9. “I’m very thankful it didn’t, and I thank God every day. … I feel the worst has passed,” she said. To help increase business, Ford said she is advertising more and offering additional specials at the restaurant. 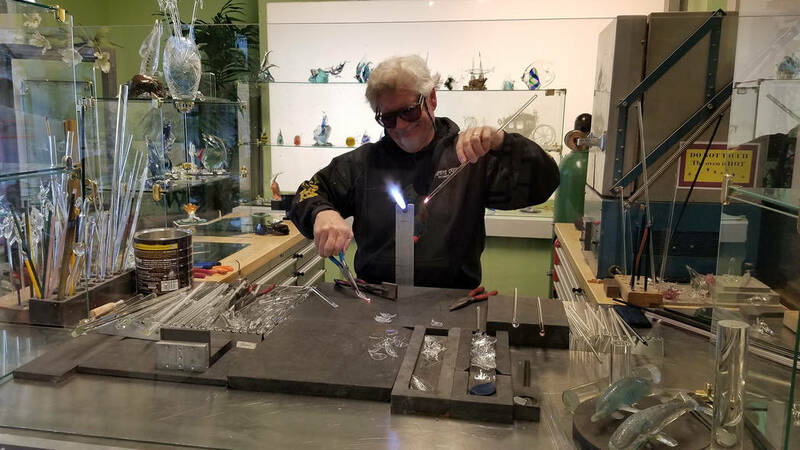 “My business has not been impacted by that at all … it may be up,” said Kris Thompson, owner of Boulder City Florist, 1229 Arizona St.
Thompson’s husband, Dan, is a glass blower and creates unique pieces of art that are sold in the shop. Railroad Pass Casino, just outside city limits, has seen good things since the interstate opened, according to owner Joe DeSimone. When I-11 opened, the Nevada Department of Transportation estimated it would reduced travel time to Henderson and Hoover Dam by as much as 30 minutes. DeSimone also said all of the exits near Railroad Pass Casino are now open, and the number of vehicles going by has increased. Also, locals are more familiar with the exits, which has also helped. Boulder City Chamber of Commerce CEO Jill Rowland-Lagan said the new interstate has brought an increased interest from out-of-state businesses that are interested in opening in town. For Alpaca Imports, formerly located at 1603 Boulder City Parkway, the impact was different. The business closed in September and relocated to the Fashion Outlets of Las Vegas in Primm. Shortly after closing, several people who spoke with owner Kevin Devine, said the closure was expected and a direct result of I-11 opening. “He works on sheer numbers, and the writing was on the wall with him,” Rowland-Lagan said in September. She said that through the Economic Vitality Commission, she, City Manager Al Noyola and several council members met with Devine, who told them he was negotiating for another location with more traffic. The Boulder City Review reached out to other local businesses about the impact of I-11, but they either declined to comment or did not respond by deadline.